Milly loves to hear from you! Please note that while Milly reads all of her email, it may take some time before you receive a response due to deadlines and other commitments. She’ll respond as soon as possible! You can tweet her @MillyTaiden. 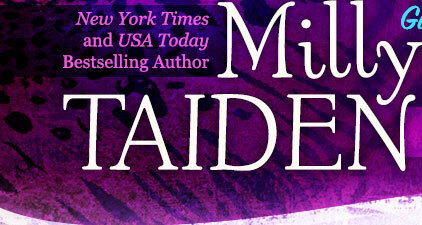 Answers about the most important questions regarding Milly’s books and series can also be found on her FAQ page. If you don’t have a specific question, but would like to be kept up to date when Milly has a new book out, feel free to join her mailing list. Be among the first to learn not only about new and upcoming books but also appearances and signings as well as special promotions and giveaways! You won’t be inundated with emails (she is way too busy) and Milly will never give or sell your information to anyone.